Gone are the days in which acne is a problem suffered only by teenagers. Adults everywhere are suffering from acne in unprecedented ways. Effecting a reported 40-50 Million Americans, acne is the most common skin disorder in the US. What if we told you that your day-to-day showering habits could be the key to unlocking your adult onset acne? These three, easy to tweak shower habits could be causing your acne. One of the more surprising causes of acne is washing your body in the wrong order. While it seems irrelevant (you know, because there’s soap involved? ), washing the dirtiest parts of your body first can spread bacteria to the clean areas. Not only does this sound gross, but it can also cause issues with your skin. THE FIX: Luckily for us, the fix to this is simple. While some people have separate wash cloths for different areas of the body, you could do almost as good by starting your cleaning routine with the cleanest areas of your body and working your way to the dirty. Keep in mind that we’re not talking what looks visibly dirty, we’re talking about where the most bacteria lives. Since bacteria likes dark, moist places, you should wash those places last. While you’re at it, make sure you’re using a clean towel to pat your skin dry. Avoid rubbing, and avoid reusing the same towel twice. Washing up is part of (most of) our daily routines. One thing to consider is whether or not you’re using the right soaps and scrubs for your skin type. Using harsh, chemical filled shampoos, soaps, and scrubs can lead to inflammation, over production of oil, and can even leave your body covered with the bacteria you’re trying so hard to get rid of. THE FIX: Knowing your skin type and choosing low-chemical fragrance-free cleansers is an essential part of maintaining balance for your skin. In case we need a refresher, most acne is caused by a combination of pores and hair follicles, excess dirt or oil, and inflammation. While each of these leads to a different kind of acne, managing all three would be the metaphorical trifecta to keeping your skin breakout-free. A two-part problem, not managing your water properly can lead to acne pretty quickly. I know, it’s hard to believe that water could be causing acne. However, simple problems like showering in water that’s too hot, or too cold, could be the culprit behind your skin’s revisit to the 80’s. THE FIX: Using a moderate, lukewarm water temperature to wash up is a great way to keep your skin from feeling traumatized. Bonus material: Sometimes “hard” water (water filled with trace metals) can cause a skin panic attack. If nothing else works, try filtering the metals out of your water. 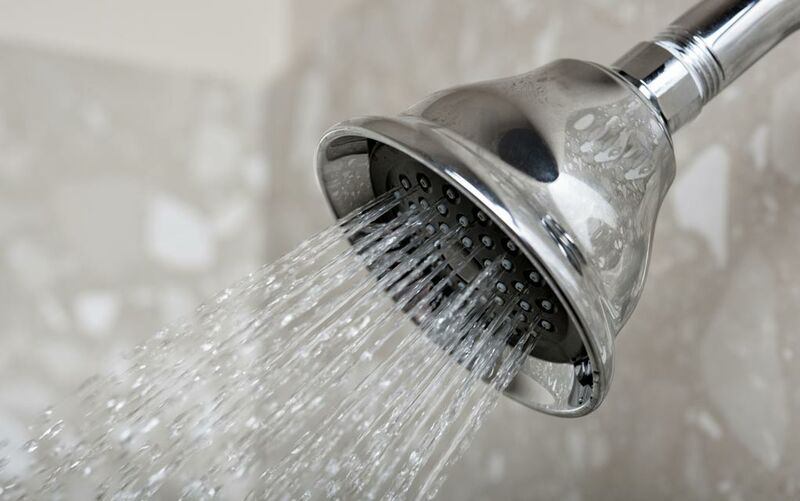 Head to Google and find a shower head that reduces the metal in your water through an attachable filter. All of these tips will help you maintain clear skin, but what if you’ve already got a breakout that’s sending up SOS flares? Don’t panic. Clearing your skin is mainly about respecting your skin. Aside from those related to serious internal imbalances, most small breakouts can be cleared with applying a few warm compresses, tea tree oil, jojoba oil, or aloe gel topically, using a calming moisturizer, and drinking a LOT more water. Combine these methods with the changes to your shower routine, and you’re on your way back to clear skin heaven.